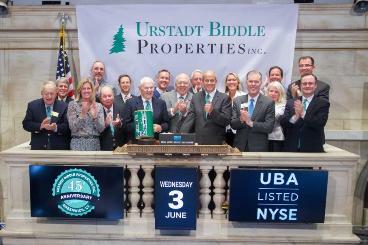 Corporate Overview - Urstadt Biddle Properties Inc.
Urstadt Biddle Properties Inc. (NYSE: UBA) is a self-administered equity real estate investment trust ("REIT") founded in 1969. We provide investors with a means of participating in the ownership of income-producing properties with ready liquidity. We are a proven leader in the ownership, operation, and redevelopment of high quality retail shopping centers predominantly located in the suburban, high demographic, high barrier to entry communities surrounding New York City. We take a disciplined, conservative approach to every aspect of commercial retail real estate. Whether its redevelopment, property management, or acquisitions, we make sound, strategic decisions based on solid demographics, broad experience, and stable resources. This has led many real estate experts to consider our property portfolio to be one of the highest quality portfolios of assets in our industry. As a REIT we are not required to pay federal income taxes. The basic requirement of a REIT is that it must be primarily in the business of owning real estate and pay dividends to shareholders equal to at least 90% of its taxable income. Our general business plan is to own open air shopping centers and retail properties in the New York Metro area with a focus on communities within commuting distance to New York City, to self- manage and lease all our properties, to have a conservative amount of debt, and keep our ownership relatively simple by investing in fee positions (owning the land and buildings) and avoiding, if possible, complicated joint venture or leasehold investments. We strive to buy well located properties in our market where we can increase the cash flow over time through renovation and/or leasing that will improve the tenant's businesses and make the property more valuable. Our philosophy recognizes that it often can take many years for a property to reach its full potential. Although commercial real estate can a be risky business, we have chosen to avoid developing vacant land into shopping centers and we are in the more stable business of buying existing shopping centers and improving them. We are experienced in designing tax efficient structures for sellers wishing to defer capital gains taxes through the formation of Down-REITS and other partnership forms. We are also experienced in assisting owners wishing to buyout partners or resolve partnership disputes and divergent interests of potential sellers. Additionally, we provide property management and leasing services for other property owners in our target market. We have two Classes of Common Stock that are traded on the New York Stock Exchange under the ticker symbols UBP and UBA. These stocks are virtually identical in their rights except UBA receives at least a 10% higher dividend than UBP and has 1/20th of the vote that a share of UBP has. The majority of the UBP shares are owned by management who tend not to sell or trade their shares. Thus, UBA is much more liquid and is the stock that most institutions choose to invest in. We also have two classes of Preferred Stock, which trade on the New York Stock Exchange under the ticker symbols UBPRG, and UBPRH. We are proud of our accomplishments and optimistic about our future and invite you to explore the rest of our website to learn more about the Company and depending on your interests either consider leasing stores from us, talking to us about a property you own or represent for sale, or invest alongside management in the publicly traded equity of our Company.